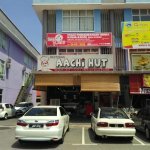 We were on a long holiday trip and missing home style food which i really liked at Aachi hut... this restaurant has asian/indian menu..they have choices for vegetarians as well.. i really liked the taste would love to visit again. 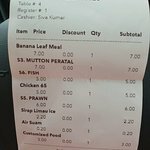 Loved the mutton peratal. Must try for mutton lovers. A tad bit pricey but worth it. Comfortable ambience & clean. They have to go back to the basics again in selling proper Indian food. They serve Rasam which is flat without the basic ingredients of tamarind.I brought it to the attention of the owner and he gave me an answer that he did not make the Rasam and he did not taste it yet. That reflects on the character. The next morning I ordered Appom for breakfast and I thought that I will receive the kind which has photos posted all over their walls inside their outfit. The 1st waiter brought the batter to the front of the outfit and turned on the stove. He did not have the slightest clue on what was happening then came the 2nd waiter and he carried on where the job was left off. When I received the Appom it was nowhere near the photo posted on the wall and not to mention the taste which was completely flat. In my opinion, all the waiters working in that outfit where previously working in a mortuary, the reason for saying that is they all give you a strange look without smiling. I’ve tried many curry restaurant and stalls... this is by far best in Port Dickson!High quality food n beverages!Prompt and friendly servers!Nice ambience! Been to Aachi Hut? Share your experiences!